Another possible addition: make the System Info and System Properties information as we have it in the CMS also available in the console. For testing: this issue has quite some changes, mostly in the UI of the console. in the top-left we now show a Hippo logo with a tooltip that displays the Hippo Release version. the dropdown menu can be navigated with the keyboard: once the menu is focused (either by pressing TAB or using the new keyboard shortcut ALT+j) the left and right arrow keys can be used to go to the next/previous dropdown and the up/down arrow keys can be used to select a menu item. Pressing ESC will close the dropdown menu, and pressing either ENTER or SPACE will execute the highlighted menu item. 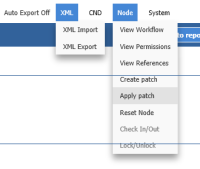 the 'Node' dropdown menu contains two items that can be in active or disabled state ('check in/out' and 'lock/unlock') depending on the node type. to test the 'check in/out' state switch, select the node '/hippo:namespaces'. to test the 'lock/unlock' button, start the CMS with targeting and select the modelTrainer node. in general, the TAB-key behaviour has been refined; after loading the console, pressing TAB will focus the first item on the page (enable/disable auto-export) and so on. The only quirk here is that the RESET button receives focus before the WRITE CHANGES button. the system dropdown menu contains a new item 'Info' which displays a dialog showing system information, similar to the system-info panel in the CMS.